The new method of client-centered ghost research. 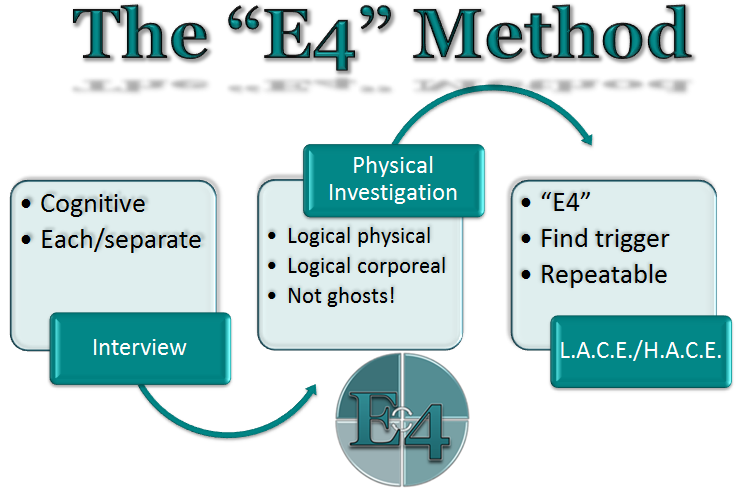 The E4 Method is a blend of tradional and non-traditional approaches from Parapsychology, interviewing specialists, as well as the "Ghost Excavator" John Sabol. The "E4" part is what separates this method from most traditional amateur paranormal group approaches. Prior to conducting the interview the client will need to be thoroughly briefed on what to expect. The biggest blockade to a successful investigation is communication with the client. You must let the client know what to expect, how the process will work, and that this will take multiple visits to truly find answers. In the past we asked many questions to dig into the knowledge of the paranormal of the client, with television shows being the main guide for many clients and investigators this makes those questions a lot easier to ask. In order to guide the client through the process you should first understand what they expect to happen. Ask them what they know and what they expect to happen. When they are done you can correct their view and let them know that the processes on television are for entertainment only and are highly subjective. If they want things to stop completely then this process will obviously be a bit different. Conducting the interview and physical investigation are still necessary, but the study criteria will be designed around empowering the client and not interaction. Lastly, the client must be aware that it will be necessary for them to participate in order for this process to work. With this they should understand that they will only be asked to do what they have already done prior to and during the events they encountered as well as be observed living their normal lives. Creating this process I evaluated the top three differences for each cases and tried to design a solid outline for conducting a case within most of these boundaries. Obviously these factors will guide the process in different directions or will stop prior to the spiritual investigation if necessary. Types of client: Clients range from those who have had some psychic experiences as a child to those who have had them from childhood to now as well as those who have had these experiences run in the family. Some clients know they are a walking "antenna" and some have no idea they may actually be psychic. Granted, others have had no prior experiences and may have completely changed their belief system within the last few weeks or days based on these personal experiences. Type of outcome desired by client. Some want things to stop and others want validation while some want both. This process below is geared more toward the validation angle since that has become the most common response (in years past it was just get things to stop and we hoped to gather evidence along the way). Again, the whole process should be laid out to the client in advance. You must let them know that you are not there to judge them, prove if they are competent or crazy, or to prove or disprove a ghost is present. They must understand you are there to get to the bottom of whatever is happening based on judgment and observation. The client must also understand that despite their firm beliefs that a ghost may be present there are also many other alternatives that may be found so they must be willing to accept ideas that will go against what they have become to believe. This part is important in the aspect that you never confirm anything with the client that a ghost may be responsible, this will only serve to validate their beliefs and will make things very difficult for you if you are to present logical explanations later. The E4 Method begins with a thorough interview. With the interview you will need to first establish their feelings about ghosts, what they feel is happening, why it could be happening, and what they expect from all of this. Obviously earlier you let them know the process, but you should get to know how they feel about the paranormal as well as their particular situation. From there you will dig into the events that they were a part of. The most effective form of interviewing is the cognitive interview. This technique draws more detail than any other form of interview. The first order of business is to establish a baseline for how they answer questions and provide detail. The cognitive interview is outlined below, but there is much more detail about the interview process (and the other steps as well) that are not discussed here due to space and to focus on details. Ask them to describe their day for five minutes. This may sound easy, but most people will easily be describing themselves getting back bed at night within two minutes. When you realize they are not going to make five minutes stop them and have them go back to the morning. "You said you ate breakfast around eight, what did you have for breakfast? How did you go about preparing the eggs? When you poured your orange juice, what kind was it, what kind of glass did you use, did you leave the carton on the counter? Please be as descriptive as possible." This technique is twofold; first we are training them to be descriptive, and second, we are able to identify their emotional responses to questions. How they display anger, frustration, happiness, etc. should be noted (the basic emotions are: anger, fear, sadness, disgust, contempt, surprise, happiness or joy). There are always discussions on creating baselines for equipment, but never for the client themselves. The cognitive interview does not need to be done for each event, but only for defining events (the one that made them contact you or changed how they felt about things) or events involving multiple witnesses. Obviously events where no one was present do not need to be evaluated. The cognitive interview approach is broken into four distinct sections that must be used in this order for it to be effective. There are a couple of variations of the cognitive interview, but I have found this to be the most common and easiest for amateur interviewers to perform. 1. Reconstruct the circumstances. Have the witness start with what they were doing before the event occurred. Have them describe their mood, the setting of the location of the event. The witness should be able to describe as much as possible about their self and the environment as much as possible prior to the event occurring. This information is two-fold. First, it will help them remember more detail about what took place. Second, it will give us possible clues as to paranormal triggers or the possibility of logical explanations. 2. Report everything. A client may hold back information because they may not think it is important to the overall case. Telling them to not hold anything back is important to help their memory in telling the story. This is the point in which you would have them tell their story. As the witness is telling their story be sure to encourage this by asking questions. Ask them specific information about the setting during the story; location of pets, were the lights on, did they notice anything happening outside, etc. Also, with each change in context be sure to get specifics about their feelings along the way. Using the present tense you might ask, “What do you see?” or “How do you feel about what you see?” This encourages more detail through remembering. It is important to ask these questions during their replay of the story to help jog their memory and by giving their feelings they are more likely to connect to the event to remember even more about it. 3. Recall the events in a different order. When the witness has completed their story tell them you want them to tell the story backwards or from various points forward. This isn’t to thwart a liar, but to go back and break up parts of the event and dig deeper into it. You might ask, “What is going on before you see the shadow at the end of the hall?” You might add “Describe everything about the scene” or “Of what you have told me, what stands out?” Go on to the next scene and repeat the process. This will allow the witnesses brain to really begin to remember fine details about the event. 4. Change perspective. Have the witness attempt to recall the events from another perspective. This could be from the viewpoint of another person in the room at the time or from a different location relevant to the event. The environment must be quiet during interviews and it is a good idea to separate witnesses as you will find people will open up a lot more when they are not around other family members. This technique will also keep people from feeding information to each other and will speed up the overall process of interviewing. Lastly, there should also be two interviewers per witness, this is so one person can concentrate on the witness and be free from writing as well as having someone else present to observe the interviewee. Recording the interview (audio or video or both) is highly recommended (with permission of course). From the interview you will gather as much information about each event, how each person feels about the events, what they think may be responsible (is it potentially logically explainable or definitely a ghost), what they would like the investigators to do, create a timeline of events, and create a map of the home with events listed. A timeline and map will give you a perspective on whether the events are increasing in frequency or intensity. If increasing in frequency it could be paranoia, increase in intensity points toward an apparition (especially if focused on the clients), and an increase in both means the client has lost their mental control over the situation and needs guidance immediately. The map will give you clues as to where to look and what to look for with the physical investigation as well as the spiritual investigation if necessary. This physical investigation consists of looking for logical explanations ONLY. It looks at each event individually and evaluates any environmental factor and may require simulation of events to test each theory. If enough evidence points toward a logical explanation or if the event is more than likely a random event then it will be excluded from the spiritual investigation. Physical investigations need to be very detailed and thorough. If a client sees a shadow in a hallway all methods necessary to create the exact conditions as well as test the hallway under various conditions should be employed (car/truck headlights in various driveways, lights in rooms, time of day, etc.). It may even be necessary to record people sleeping (although the big problem with this is that they may fear this approach thanks to Hollywood) to determine if shaking beds are caused by restless leg syndrome or anything else logical. With the physical examination/investigation you must think out of the box. Along with evaluating the environment it will also be necessary to evaluate the corporeal aspect. A majority of events are caused not by ghosts, but by belief in ghosts. This belief can turn random events into terrorizing paranormal events that seem to defy explanation. Stress, substance abuse, current use of any medication, lack of problems solving skills, Religious beliefs, prior belief in the paranormal, and past, present, or family mental illness all need to be brought into question. In order to solve a mystery all information needs to be put on the table, if a client is unwilling it may mean they have something to hide or are afraid they might be wrong about a ghost being the cause. A lack of problem solving skills may be discovered when looking for logical solutions as well as through interviewing, but again thinking outside the box you may present family members with tests to evaluate their ability to solve problems. A client being a skeptic then suddenly changing into a true believer is many times another tip off that there could be a belief factor involved. Many times the client will get caught up in their personal events and changing perspective that they throw common sense out the window. While belief may play a role in creating the events (see sheep/goat effect) we are merely looking for when a change in belief occurred. This change is critical for understanding how belief plays a role in paranormal events and further "belief training" will occur prior to the next stage of the methodology. This process will be exlained in greater detail after I have utilized various methods with clients. If the events seem to point toward a possible ghostly conclusion then it is time to move toward the spiritual investigation which is made of Active Context Exercises (local and historical), which is designed to focus NOT on GHOSTS, APPARITIONS, or HAUNTINGS, BUT the CLIENT and the ENVIRONMENT. This is done no matter what type of ghost may be driving the events. The "types" of ghosts follow Parapsychology definitions, not theoretical specific types of ghosts (shadow people, demons, creepers, etc.). These three basic types have been determined through over 100 years of case and direct observational studies. Apparition - An apparition is more than just the visual, this also includes what is heard, felt, smelled, or otherwise sensed part of the human personality that has somehow survived the death of the body. Beyond this definition an apparition has two other distinct features. They display intelligence and communication. An apparition shows some sort of intelligence behind their actions and seems focused in its behavior and not merely random, there may be symbolism toward the living, messages or words related to the client without potential for coincidence, or specific personal objects of particular clients are targeted. Along with the intelligence there must be some sort of communication. While moving of personal objects displays intelligence it alone is not enough to dictate communication although it may seem personal. Hearing ones name, being touched, seeing an apparition looking at or watching the client are all signs of communication. Haunting - A haunting is merely residual energy and displays no intelligence or communication toward the client. A haunting may exhibit intelligence or seemingly portray communication, but these efforts would not be personal toward the client (although may be perceived to be). Residual energy may be placed in a location for good or bad reasons and does not require "a violent or sudden death" to be created as perpetuated by many. Poltergeist - A Poltergeist is also referred to as RSPK, Recurrent Spontaneous Psychokinesis. This is basically driven by living stress and is unconscious behavior from the living people within the home. Therefore, if it is suspected that the events are based on the living it would be back to the second step (Physical investigation), unless this PK activity has "tagalong" (apparition) then you would work on eliminating the stress then dealing with the apparition if it continues to linger. The first step in the spiritual research step is to design client or investigator based activities to hopefully create a spontaneous manifestation. This study criterion is designed around the events that you took notes on during the interview and through the physical examination have eliminated some or many of them. The ones that remain should be not just reenacted, but recreated and more or less replayed with as much detail (physically and emotionally) as possible. If the events may have created a apparition to communicate or a haunting to manifest there may be something hidden inside of the daily routine or random act that caused the spontaneous event to occur. Conducting these reenactments may also help jog the client's mind about what other details were there or make a logical explanation pop up out of nowhere. These study criteria may also entail designing historical reenactments focused on former inhabitants using time specific cultural details (language, dress, smells, names, places, music, etc.). These exercises are performed as local and historical in order to create a "time sandwich" which will give the best possible chance at repeating a spontaneous event. These exercises are ongoing and incorporate multiple scenes with each event. For each scene emphasis is on recreating the emotional and physical context of the original scene, not merely reenacting it. These exercises are repeated until either a spontaneous event occurs (will continue with scene as long as possible in order to stay "connected"), client is no longer comfortable, or too much time and energy is spent focusing on it and another direction must be explored. This exercise focuses on the client's personal experience that happened recently. These exercises are repeated with an emphasis on the emotional and physical context. These are specific to the person as well as to an event. For each exercise only a specific type of event will be expected; controls will be put into place and appropriate recording methods will be used and no other types of phenomenon will be looked for (in other words, a client sees a shadow; we will not be conducting EVP sessions or using other methods of contact). These exercises are conducted by either the investigators, clients, or a combination of both. These exercises explore the past history of the location in reference those who were attached to the home (not merely those who died there). These exercises will focus on multiple potential contact points by focusing on specific cultural events, terminology, places, people, etc. that are relevant to the specific person being "contacted" in the exercise. Instead of trying to force contact from the past we are attempting to connect to it. Instead of assuming the apparition/haunting is a specific person this will allow for immersion into various "suspects" of the origin of contact. This method is very closely related to the methods created and used by John Sabol, the "Ghost Excavator". The E4 Method stands for Eliminate, Establish, Enlist, and Engage. 1. Eliminate - The standard paranormal investigation has been proven to be completely unscientific and this subjective approach should be abandoned. This subjective approach has only served to create more questions from the data than providing answers to the client or to the overall field of research. The act of investigators immersing themselves into the investigation on the behalf of the client is pointless other than providing the investigators with their own selfish chance at having a subjective experience. 2. Establish - Establish scientific controls. Despite what many investigators think the standard model of paranormal investigation is hardly scientific. Using scientific instruments does not create a scientific investigation. Science is a process not a piece of equipment or subjective experience. Only by creating controls and processes and eliminating the subjective approach as much as possible can we begin to call an uncontrolled observational investigation scientific in the least. The focus on tools and not the environment has been the biggest downfall along with basic investigation protocol (the thought that "lights out" is scientific or controlled, misunderstanding of how uncontrolled a "lockdown" is, jumping to conclusions with evidence despite controls or ability to verify/refute with backup evidence, ineffective use of recording equipment, sampling errors, reliance on unproven or entertainment geared equipment, using history as a guide instead of current events, etc.). When using the E4 Method we are replaying a client's events and are ONLY concerned about the SPECIFIC EVENT that happened to them initially. In other words, if a client saw a shadow in their kitchen after coming home from the grocery store we will replay that event using groceries as props, the client in the same state of mind, and the environment the same as much as possible. When observing this "performance" we are only concerned about the shadow, not EVP, not listening for voices, not watching for moving objects, etc. The study is designed around the environment and the phenomena that occurs within it. With this approach we are creating controls for the potential event alone and will thus "ignore" other events. However, since paranormal events are spontaneous we will encourage potential paranormal events that occur outside of the planned ones. With the performance over we can then repeat it while focusing on the new behavior and hopefully create a repeatable trigger to a spontaneous event (the whole goal with the E4 Method). 3. Enlist - Apparitions are about interaction. Investigators were called to a location due to living people having situations they feel are paranormal, so why not study the people who are having these situations happening to them? 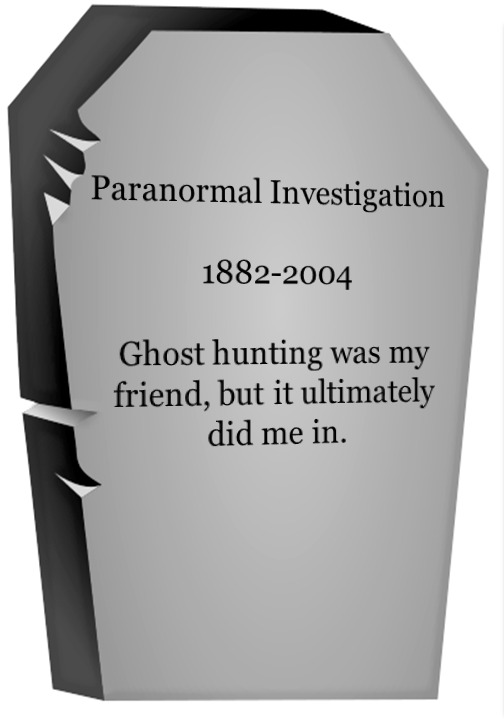 Clients have been conditioned to the culture of ghost hunting to expect investigators to come in to a location to investigate while they go about their normal routine or watch television. Many investigators will joke that nothing seems to happen when they are around, this is because the situations that created these events has been altered. Utilizing the client under controlled conditions rather than creating duplicated conditions using people who are not part of the ongoing events is a more logical method of producing observable and measurable activity. This process eliminates the subjective experience, creates controls, and puts the right people in the right place to create the conditions necessary to duplicate paranormal events while leaving the investigators to do what they came to do - identify patterns and triggers, record these events, and help the client through their situation. Many clients may fear this aspect, but in order for them to "validate" or even face their fears they must attempt to duplicate the conditions. These recreations are not attempts to provoke or create situations for investigators to call out to a spirit/ghost/apparition, etc. only to recreate the exact conditions prior to, leading up to, during, and after the event. 4. Engage - In nearly all paranormal investigations the goal is to interact or record a spirit/ghost. The goal should be to interact with the environment instead of a physical entity, since spirits/ghosts are not actually physical, but psychic (mental) manifestations. If ghosts were physical they would have been documented, discovered, and more than likely exploited a long time ago. Since spirits/ghosts are not proven to exist there is little reason scientifically to attempt to study them. Investigating something that is not proven to be present is futile (putting the cart before the horse). Using methods created by the "Ghost Excavator" John Sabol, one should engage the environment vertically instead of horizontally with 21st century tools. Situations requiring a historical context will utilize the "P.O.P." method (Participate, Observe, Perform) of a Ghost Excavation. Similar scenarios will be conducted by the clients (or stand in investigators if truly necessary) which will use the same method. Conducting scenarios based on client interaction you are removing the investigator from the scene and creating objective observation study. Beyond the scientific aspect you are providing the client with the ability to face their fears and become empowered over the event. In most ghost cases fear is the primary reason for the activity, not a ghost, demon, etc. and the client has become fearful of any type of action in their home as ultimately feels it is paranormally controlled. With client-based scenarios you have the ability to create or cease interaction with apparitions (depending upon the situation and client's intended direction with the case) as well as the ability to create new imprinted information on the environment to "cover up" or "erase" existing hauntings. Conducting these scenarios will also add to the potential of discovering a logcial explanation. Cultural scenarios will also be used as way to induce interaction with imprinted haunting activity or as a way to connect to interactive/communicative apparitions. These scenarios will be intertwined or used separately depending upon the conditions of the case as well as the client's needs. A cultrual based scenario may open the research project as a warmup for the clients and the environment followed by a client-based scenario. The use of past and recent history should be able to induce interaction or trigger an existing haunting without causing undo imprinting unless this is the goal. If these methods succeed the goal would be to create a spontaneous paranormal event. When the event occurs investigators (researchers) will be positioned to record and interact with the participants to encourage them to continue doing what they are doing in order to continue the event. Reacting to a paranormal event negatively (screaming, pausing, focusing on event, etc.) has been noted to produce a decline (K.J. Batcheldor, "Macro-PK in Group Sittings: Theoretical and Practical Aspects). A client based scenario is just the warm-up. With these characterizations we will be able to hopefully create scenarios that focus on specific triggers that will hopefully become repeatable within that location. Understanding these triggers can help eliminate the activity if the client desires and this knowledge can be used in future research projects as well as potentially helping clients without having to have investigators present. The goal with this would be to not only create repeatable spontaneous events for engaged study, but to provide repeatable experimentation for other groups, scientists, and even skeptics. Copyright © 2012 Brian Parsons, BP Guy Productions. All Rights Reserved.